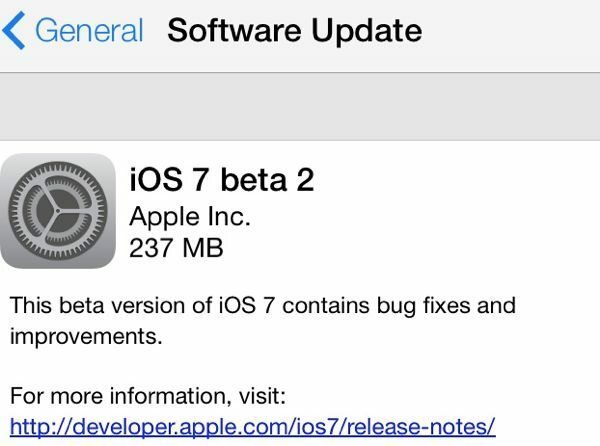 Apple has released its new iOS 7 beta 2 update for the iPhone, iPad and iPad mini today, developers can now get to grips with all the new features added in this new 237 MB download. This update has been released just 2 weeks after beta 1 was seeded, the full changelog is below, we will mention a few new features here as well. The Phones Review developer team have been playing around today and we will be revealing more about iOS 7 beta 2 over the next few days. Before we get into the new features, developers can open their settings app running iOS 7 beta 1 and then head into General and then Software update. When you have done the above it will show the new iOS 7 beta 2 update, which contains bug fixes and improvements, the install takes a few minutes. iOS 7 beta 2 features is more stable and faster all round, you will also get to see the Voice memos app, new female and male Siri voices, there is a new animation when messages are sent, the message send button is much bigger, and you will also notice within the message app the contacts photos within the conversation threads. Other little bits include the ability to see message timestamps when you swipe the display to the left, and contact nicknames shows up in messages now rather than the full name. Beta 2 also includes the FaceTime app with a darker background, the reminders app works smoothly with UI touchups, as well as Newsstand app UI changes, and the music controls are now always on lock screen when the songs are playing. The best part thanks to iOS 7 beta 2 is the ability to use on the iPad and iPad mini, we have also noticed the Clock Icon change inside Control Center, Added button in Weather for additional cities or all-city access, as well as Shared Photo Stream notification. For more information please visit BGR for the full changelog, we will be bringing you much more once we have played around with iOS 7 beta 2. If you have installed this new update please do let us know what you think in the comments. HTC one beter set up !